I may be getting ahead of myself here, since I have only run one marathon, and completed it in 3:51, but I was wondering how much training I would have to do to be able to run a sub-3 hour marathon. I am under no illusion that I could win a marathon, but it would be great to be able to run much faster. So how possible is it for someone like me(male, early 30s) to eventually do sub-3 hours(like maybe by my 4th or 5th marathon), if my first was 3:51 minutes? And if you are currently in the sub-3 group, how did you do in your first marathon? And what is your training like? If I am not mistaken, I think the sub-3 hour group is the top 2% or 5% of marathon runners. In case you don't know, the first marathon I did was the Yonkers marathon, one of the hillier marathons in the eastern U.S. I think I would have completed the race 10 to maybe 15 minutes faster if it wasn't so hilly. Keep running vegan, and TIA! First of all, I think it varies a lot with previous amount of training (is your body ready for one or two years of hard exercise, or are you likely to get injured). Add to that body constitution, weight makes a lot of difference for running. And finally and probably most important, genetic disposition. As an example, Donald Thomas took up high jumping in 2006 and won a world championship in 2007. Some people will have an easier road to sub 3 than others and will need less training. I have no idea if you're one of those lucky few. But it is impossible to say that "it takes X hours of training to get there" as a general rule. I'd say that sub 3 hours is a tougher goal than sub 40 minutes for 10 km. It takes a lot of training outside your comfort zone, both speed training and long distance sessions with blocks of fast running. Also, it takes consistency and motivation to keep training hard for more than a year. I'll have a try at doing sub 3 next weekend so I'll probably have some more insight after that. It hasn't been a goal for me this year but I've averaged four-five sessions per week this year, normally 60-100 km/week as I prefer quality training over large amounts of slow running. From what I've read, that's close to the bare minimum, most marathoners with sub 3 ambitions do larger weekly amounts from what I know. I did not run in high school or college. I ran my first race on my 25th birthday - a half marathon, which I finished in 2:29 (long story). Anyway, two years later, I ran my first marathon in 3:59. When I ran my first marathon, I was probably running 30 miles per week, peaking at about 40-45. I finally broke 3 hours in my 6th marathon - 2:57 in Baltimore (almost as hilly as Yonkers). Six weeks later, I ran a 2:52 in Philadelphia. I've now run 20 or so marathons and more of them are sub-3 than not. To finally crack 3 hours, I was running 60-70 miles per week with two hard workouts per week and a long run. I believe that it takes a while to build a cardiovascular base. Some people, as hakko mentioned, don't do a lot of "junk miles" but I feel they're absolutely necessary for me. My body responds really well to high mileage. But I know that doesn't work for everyone. Please understand that it becomes exponentially more difficult to improve as you get into that territory. The difference between a 3:10 and a 2:59 is probably similar to the difference between a 3:40 and a 3:10. I don't want to discourage you - I just want you to know that it might take some time. But then again - it might not. Hmmm, maybe I need a five year plan? Forgot to ask - are you planning on running this sub-3 while juggling? If so, I have to say - I don't think you can call yourself a joggler. I mean - c'mon, you're running, not jogging. Although, 3:51 isn't jogging either. Just my opinion - but I hate when people label me as a jogger. As far as I'm concerned, jogging is the slowest speed at which you are no longer walking. Thanks for the advice DC, and Hakko. Yes, I do plan to juggle while running sub-3 hours(assuming I can do it). If I do enough marathons, maybe I'll occasionally do one without juggling, to see how it feels and for comparison purposes. It looks like I will have to run a lot more miles, though I gotta admit that breaking under 4 hours didn't feel like it required a lot of work for me. It will be rough, but like you DC my body responds well to long, slow runs. I think the long, slow, "junk" miles I've accumulated helped me run faster than interval training in which I would run super fast for short periods. I now see "junk" miles as my friend, even if I am doing 12 minute miles, which fortunately is very rare for me. I'm a little slower than I was last week because I donated blood just a few days ago(I figure I am probably 95% recovered from the marathon). Any of you guys a blood donor? I don't like the thought of being healthy if I can't help other people be healthy, and this was why I felt I had to donate. I gotta admit I don't like the term "joggler" that much either since it does imply the person is a jogger who juggles rather than a runner who juggles, and I don't like being called a "jogger" like nearly everyone here. There are a few jogglers who can do sub-3 hours, like Michal Kapral(2:50:9 is the world record I believe for joggling a marathon). I think in the 1980s, the term "ruggling"(running + juggling) was sometimes used instead of "joggling", but since "jogging" and "juggling" sound very similar, "joggling" eventually became the preferred term by the 1990s. As an aside, my problems with the term "joggling" are one of the reasons I named my blog "Wild Juggling", instead of "Wild Joggling" though I am often thinking of a name change that may use "joggling", as in "Joggling Vegan", or "Vegan Joggling". Or maybe "Veggie Joggling". Or maybe just revive "Ruggling", and rename it "Ruggling Vegan". I donate regularly and basically never feel anything. But then again I don't run the same day or do any hard runs the day(s) after. If you are going to compete you should not give blood 4-5 weeks before. I had a cold when I ran the Boston marathon this year and then a few days later, I donated blood. What a mistake! I was sick as a dog - sicker than I've ever been in my entire life that I can remember. I can't donate blood for about 10 months because I recently got a tattoo. Veganjoggler - when/where are you thinking about for your next marathon? [quote="DC Runner"]I had a cold when I ran the Boston marathon this year and then a few days later, I donated blood. What a mistake! I was sick as a dog - sicker than I've ever been in my entire life that I can remember. I can't donate blood for about 10 months because I recently got a tattoo. That sounds awful. Just yesterday I ran 22 miles and I felt fatigued and terrible for the last several miles and had to walk every now and then. As far as I can tell, this was mostly due to the blood donation 6 days before this. Before the marathon I had adapted to running 20+ miles by about the 4th time I had done it, and I eventually would run this distance about 10 times - it felt easier each time I did it. Yesterday's 22 mile run felt more like the second time I had run 20+ miles. As far as my next marathon, I am not sure. I will definitely have to wait 3 to 4 weeks before I can do one. I think I will donate blood once a year from now on, and that's only if I can get my hgb(hemoglobin) level at 16 or over. I can now confirm that running a sub-3 hour marathon is actually doable. In my case, I'd say two years of training took me there, but that's starting from always enjoying running, although never really doing it organized until now. Yes it does look very doable to me if I run enough miles. Too many former smokers I've met or read about can do sub-3 hours, and I've never been a smoker. I just ran 13.6 miles today in 1 hour and 58 minutes and it felt like an "easy" run, even with all the hills. It looks like my blood has mostly recovered from the blood donation. I hope everyone is doing great, good luck with whatever races you're doing! Seriously considering running the Philadelphia Marathon. Only thing is I may need to stay in a hotel room the night before, there's no way I am driving there from New York at 4 AM the morning of the marathon, its 130 miles away. Anyone got any suggestions? 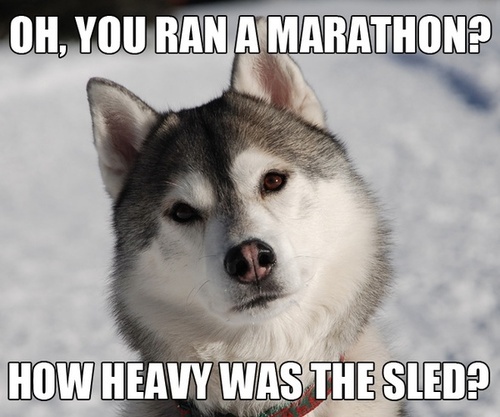 unrelated, but the perfect meme to send somebody who just ran a marathon!